​Inspired by women in movement, The Cosmos Convertible Wrap Dress is a study in versatility. Wearable as a skirt or dress, designed to layer, and intended to adapt to the style of its wearer. 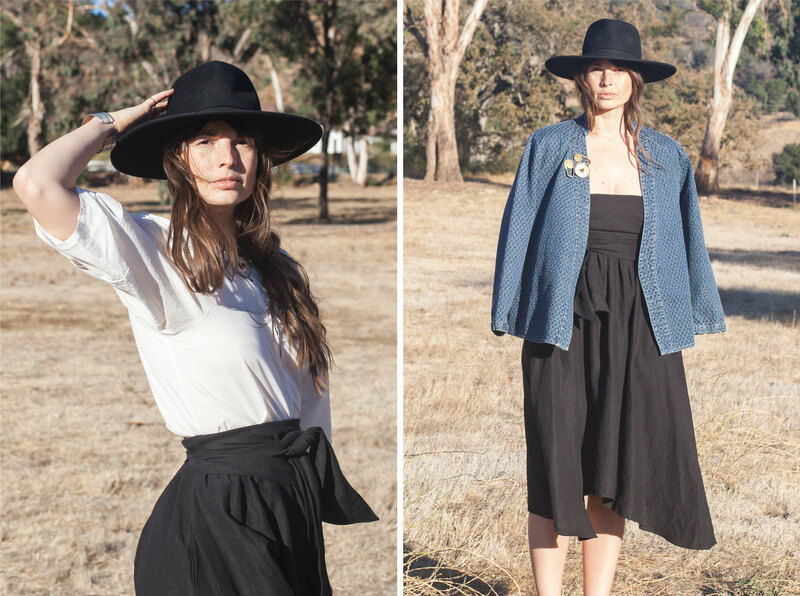 Below, our friend Lauren Spencer King — an artist, healer, and meditation leader— wears it in the California Canyons. "Putting together this outfit, I kept thinking about the outfit pairings of Georgia O'Keeffe; despite a bit of recent O'Keeffe fatigue (isn't it funny when a person becomes a "trend?!") I also can't deny being drawn to her practical way of living. She said her penchant for black clothing made things more simple, and gave her more time for painting. As a painter myself I understand this, and often create a uniform: black, white, denim; a dress that can be worn as a skirt; a Calder-inspired brooch made by my mother in the 70's worn in different ways; shoes that go with everything. Utility and versatility— they make for a certain kind of freedom."